Why would a data scientist use Kafka Jupyter Python KSQL TensorFlow all together in a single notebook? There is an impedance mismatch between model development using Python and its Machine Learning tool stack and a scalable, reliable data platform. The former is what you need for quick and easy prototyping to build analytic models. The latter is what you need to use for data ingestion, preprocessing, model deployment and monitoring at scale. It requires low latency, high throughput, zero data loss and 24/7 availability requirements. This is the main reason I see in the field why companies struggle to bring analytic models into production to add business value. Python in practice is not the most well-known technology for large scale and performant, reliable environments. However, it is a great tool for data scientist and a great client of a data platform like Apache Kafka. Reliable, scalable event-based streaming technology for production deployments (Apache Kafka, Kafka Connect, KSQL). Let’s quickly describe these components and then take a look at the combination of them in a Jupyter notebook. Jupyter exists to develop open-source software, open-standards, and services for interactive computing across dozens of programming languages. Therefore, it is a great tool to build analytic models using Python and machine learning / deep learning frameworks like TensorFlow. Using Jupyter notebooks (or similar tools like Google’s Colab or Hortonworks’ Zeppelin) together with Python and your favorite ML framework (TensorFlow, PyTorch, MXNet, H2O, “you-name-it”) is the best and easiest way to do prototyping and building demos. Think about use cases where you CANNOT go into production without large scale. For instance, connected car infrastructures, payment and fraud detection systems or global web applications with millions of users. This is where the Apache Kafka ecosystem comes into play. Apache Kafka is an open-source stream-processing software platform developed by Linkedin and donated to Apache Software Foundation. It is written in Scala and Java. The project aims to provide a unified, high-throughput, low-latency streaming platform for handling and processing real-time data feeds. Confluent KSQL is the streaming SQL engine that enables real-time data processing against Apache Kafka. It provides an easy-to-use, yet powerful interactive SQL interface for stream processing on Kafka; without the need to write code in a programming language such as Java or Python. KSQL is scalable, elastic, fault-tolerant. It supports a wide range of streaming operations, for example data filtering, transformations, aggregations, joins, windowing, and sessionization. Check out these slides and video recording from my talk at Big Data Spain 2018 in Madrid if you want to learn more about KSQL. Let’s now take a look at an example which combines all these technologies like Python, Jupyter, Kafka, KSQL and TensorFlow to build a scalable but easy-to-use environment for machine learning. This Jupyter notebook is not meant to be perfect using all coding and ML best practices, but just a simple guide how to build your own notebooks where you can combine Python APIs with Kafka and KSQL. We use a test data set of credit card payments from Kaggle as foundation to train an unsupervised autoencoder to detect anomalies and potential fraud in payments. Focus of this project is not just model training, but the whole Machine Learning infrastructure including data ingestion, data preprocessing, model training, model deployment and monitoring. All of this needs to be scalable, reliable and performant. Check out the complete Jupyter Notebook to see how to combine Kafka, KSQL, Numpy, Pandas, TensorFlow and Keras to integrate and preprocess data and then train your analytic model. 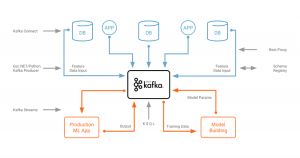 Why should a Data Scientist use Kafka and KSQL at all? Yes, you can also use Pandas, scikit-learn, TensorFlow transform, and other Python libraries in your Jupyter notebook. Please do so where it makes sense! This is not an “either … or” question. Pick the right tool for the right problem. 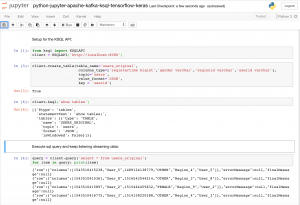 Use the existing environment of the data scientist which he loves (including Python and Jupyter) and combine it with Kafka and KSQL to integrate and continuously process real time streaming data by using a simple Python Wrapper API to execute KSQL queries. Easily connect to streaming data instead of just historical batches of data (maybe from last day, week or month, e.g. coming in via CSV files). Reuse the same logic for integration, preprocessing and monitoring and move it from your Jupyter notebook to large scale test and production systems. Check out the complete Jupyter notebook to see a full example which combines Python, Kafka, KSQL, Numpy, Pandas, TensorFlow and Keras. In my opinion, this is a great combination and valuable for both, data scientist and software engineers. I would like to get your feedback. Do you see any value in this? Or does it not make any sense in your scenarios and use cases? This entry was posted	on Friday, January 18th, 2019 at 16:15	and is filed under Analytics, Apache Kafka, Big Data, Confluent, Deep Learning, Integration, Jupyter, Kafka Connect, Kafka Streams, KSQL, Machine Learning, Open Source, Python, Stream Processing, TensorFlow. You can follow any responses to this entry through the RSS 2.0 feed. You can leave a response, or trackback from your own site.